Moonshine Sweet Tea Will Match Up To $5,000! We are excited to announce that Moonshine Sweet Tea will generously match donations up to $5,000 made to the Comfort Crew through Amplify Austin. That means you can double your donation and double your impact to support our mission to provide proven resources to help military kids and their family connect and build resiliency in the face of extraordinary challenges. 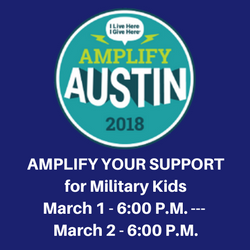 Schedule your donation in advance and it will run during Amplify Austin hours. Set up your own fundraiser page and campaign for the Comfort Crew. Email angela@comfortcrew.org if you need help setting one up. Make a donation anytime from March 1 – 6:00 p.m. to March 2 – 6:00 p.m.
Take time to learn more about the Comfort Crew and share with your friends and family. Spread the word about Amplify Austin Day on Facebook, Twitter, and IG using #AmplifyATX – look for live updates on March 1 and 2! There are 400 military families here in Central Texas who are waiting to receive Comfort Kits to help their children through deployments, reintegration, injuries, and loss so every single gift makes a difference.  These valuable resources provide strategies for children to understand and manage their feelings and increase communication for the whole family.